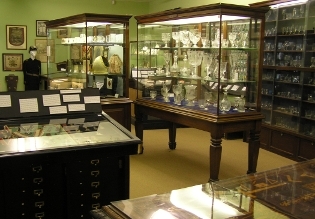 Prior to the expansion of the Museum space in 2006, the George Taylor room contained most of the Library and Museum's treasures. 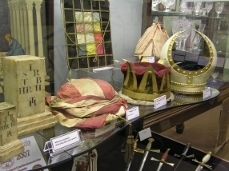 Today it houses a number of displays concerning various Masonic topics. The room contains a fine display of Royal Worcester Porcelain, which is very fitting given our location in that city. A Royal Worcester bowl is on prominent display, it being a replica of that presented to the Assistant Grand Master, Lord Northampton, at the Worcestershire Charity Festival in the year 2000. This sits above a Worcester 'Cabbage Leaf' jug dating from around 1785, which was probably designed by Robert Hancock, an engraver and member of the Athol Lodge No. 60 which met in Worcester. Other items in our porcelain collection include pink Staffordshire and Sunderland lustre bowls, bedchamber pots, and a large number of jugs and mugs, all decorated with an array of Masonic symbols and dating from the 18th and 19th centuries. We have a fine display of Masonic jewels, including a collection from orders considered to be 'Beyond the Craft' and both Christian and secular in nature. The Library and Museum team have recently assembled a fine collection of charity festival jewels, covering the main Masonic charities and dating from 1880 to 1991. This collection is almost complete and provides a colourful, interesting and informative display. Of particular note are the early jewels issued before 1890, together with those issued during the Second World War, which were made of plastic or leather. The George Taylor room also contains two cabinets of items depicting 'Freemasonry Around the World' and 'Masonry Universal'. These reflect the universality of Freemasonry and contain items including jewels made by French prisoners of war in England during the Napoleonic Wars (1793-1815), one of our collection of beautiful hand painted French aprons, and jewels from countries both near and far, such as Argentina, Canada, Cuba, Germany India, Israel, Romania, Russia and Serbia. A recent exhibit in the George Taylor room concerns 'Non-Masonic Fraternal Societies' and includes items of interest from scouting, including the Prestonian Lecture for 2012 entitled 'Scouting and Freemasonry: Two Parallel Organisations?' There is also a selection of jewels from the Ancient Order of Druids and Royal Antediluvian Order of Buffaloes, and mugs from the Independent Order of Oddfellows and the Ancient Order of Foresters. On display are two of our fine printed sashes from the latter of those four orders. The nucleus of the Library and Museum was formed towards the end of the 19th century by the late George Taylor, a Past Master of Lechmere Volunteer Lodge No. 1874, to whose zealous enthusiasm and discrimination it will remain as an abiding testimony. 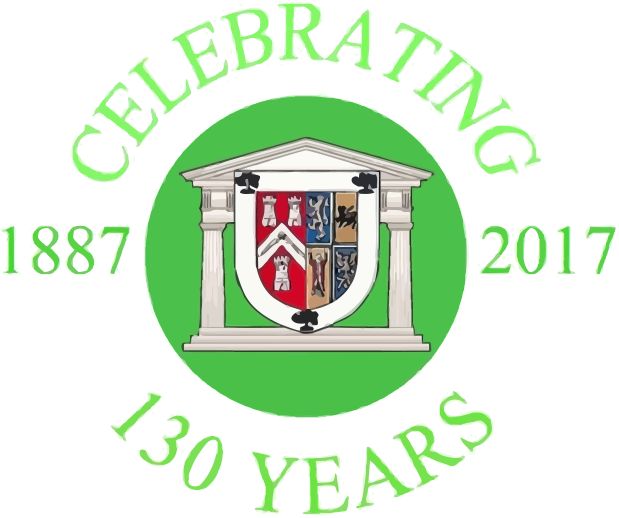 In 1884, Brother Taylor organised a Masonic exhibition at the Guildhall, Worcester, under the joint sponsorship of the then Provincial Grand Master, Sir Edmund Lechmere, Bart., MP, and the Mayor of Worcester, Brother B. Williamson, who was a member of the Lodge Semper Fidelis No. 529. This was the first exhibition to be mounted in the Midlands and it attracted interest from all over the country, with over 1,000 exhibits loaned by England's leading collectors, of which around 100 came from Brother Taylor's own collection. Two years later, Brother George held a further exhibition of his collection, this time in Kidderminster. An edition of 'The Freemason' dated 13th March 1886 contains an article concerning 'Masonic Week at Kidderminster', the 'Proposed Worcestershire Masonic Library and Museum'. 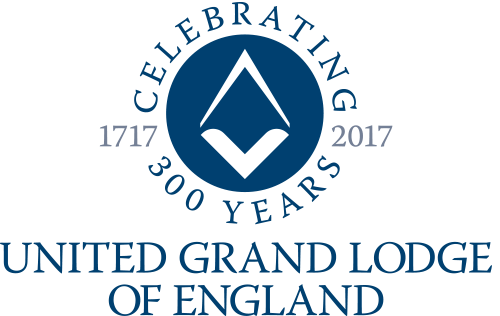 The text refers to 'The great Soiree and Exhibition' held at Worcester in 1884 by Brother Taylor with the objective of creating 'sufficient interest in Masonic literature to fund a Masonic library and museum for Worcestershire.' With a 'ready purse', Brother Taylor continued to draw together a rare and valuable collection, all at his own risk, before offering it for sale to the Province. The value of his collection, assembled with 'much labour, mixed with a good deal of pleasure' was said to be worth 'not less than 2,000 guineas', but as much of it was 'unique and unobtainable', it was not thought suitable to be assessed by a 'money standard'. The display made such an impression that, shortly afterwards, the Province negotiated to buy Brother Taylor's entire collection, which he generously sold at cost price.